The North American Ing Masters (NAIM) Championship is the North American continental championship. Featured in a variety of formats over the years, this year’s tournament — which kicked off Sunday night at the U.S. Go Congress — is a 16-person, 4-round Swiss tournament that will determine the North American Masters Champion. This tournament is invitation only, and participants are determined by qualification tournaments played over the six months before Congress begins. Qualification: All players must be rated 4 dan or higher, be eligible to represent the US internationally, and have earned enough points through qualifier competitions to be listed in the top 16 eligible, interested players. Calvin Sun 7d and Aaron Ye 4d both won their first round matches in the Redmond Cup this afternoon. 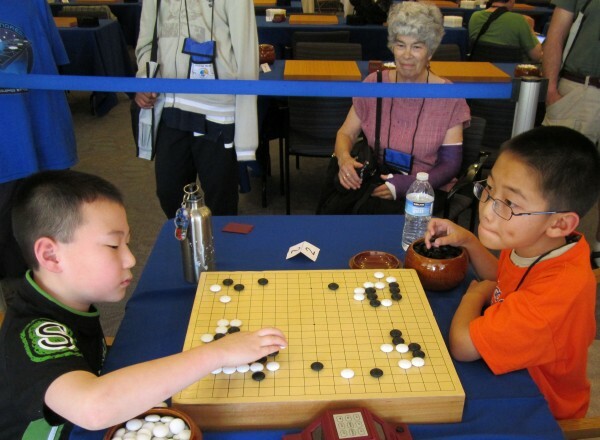 Sun, who is 14, battled Gansheng Shi 7d, age 17, in the senior division, while Ye (at left above) squared off against Sammy Zhang 4d (at right) in the Junior Division. Ye, who is only 9 years old, took his afternoon nap before the 3 pm match against Zhang, who is 11. The games were broadcast live on KGS, and Redmond Meijin Curtis Tang 7d, provided live commentary. Tang, who has won the Redmond Cup five times, has competed against both Sun and Shi, and knows their styles well. Hundreds of observers checked out the action in the English Game Room, where E-J staff broadcast the games on USGO1, 2, and 3. Tangs commentary is attached in this game, the Jr. Division match is up on the congress crosstab. Round 2 will be at 3 pm PST on Tuesday, Aug. 2, again with commentary by Tang, the third round will be on Thursday the 4th, at 3 pm. – Paul Barchilon, E-J Youth Editor. Photo: Aaron Ye 4d 9 (l) vs. Sammy Zhang (r) while Redmond Cup founder None Redmond looks on.